Before the existence of this universe, there was nothing except God. He eventually created Lord Brahma, who then took the Lord’s guidance and started Creation. He first created the universe, filled with many unique worlds. He then created Manu, the first man, who began to produce a lineage. 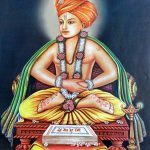 Brahma himself created the four Sanakadi Rishis and the Prajapatis. Of the Prajapatis, Sage Kardama was the foremost. He sought a righteous wife who would be the perfect complement to his spiritual life. So he devoted 10,000 years to meditate on Lord Vishnu. Alas, the Lord did not appear before him even after all these years. The rishi was crestfallen, and started to shed tears of remorse. As the drops touched the ground, the Lord appeared in full-fledged form before Kardama. 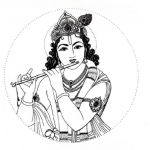 Srimad Bhagavatam describes this encounter in complete form. 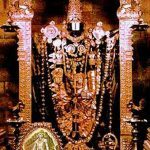 It says, Sage Kardama saw the supreme form of the Lord, who is free from all materialistic objects. He wore a garland of white lotuses, was also clad in a bright white silk cloth, and His lotus face was outlined by His dark curly locks. Adorned with a crown and earrings, He held His conch, disc and mace in three of His hands, and playfully held a white lily in the fourth. He looked at his ardent devotee with a beautiful smile that touched the heart! The Lord stood in the air with His lotus feet placed on the shoulders of Garuda. There was a golden streak on His chest, with the Kaustubha gem dangling from His neck. Kardama obliged. The marriage occurred in Kushavati, which is present-day Goa. After the wedding, Sage Kardama continued his prolonged tapas. 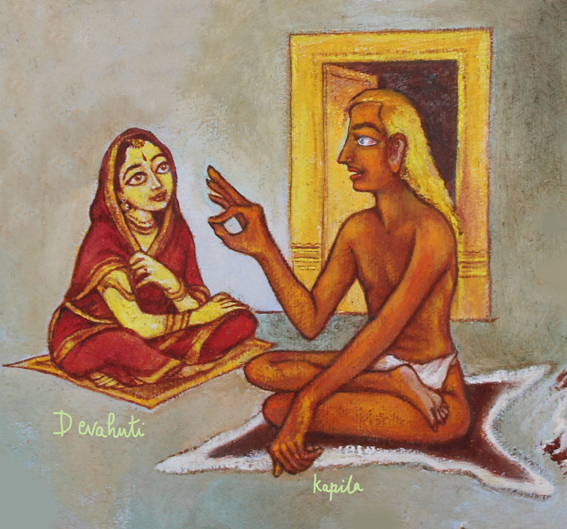 Devahuti, who was still very young, was very devoted to her husband. Sri Swamiji describes her care as equivalent to Parvati’s worship of Lord Shiva. As the sage was constantly immersed in deep meditation, unaware of his surroundings, Devahuti would grind fruits into a paste and apply it to Kardama’s skin so it could absorb in his pores. She would bathe the rishi lovingly. She would care for Sage Kardama day and night, to the point where she became gaunt and pale, even more so than her own husband who was lost in tapas. Kardama asked Devahuti to take a dip in the holy waters of Bindu Saras. As she came out, her appearance completely changed. She stepped out of the lake shining with beauty. Sage Kardama also dipped in the lake, coming out as a handsome young man. They then spent the next 10,000 years together, traveling to every nook and corner of the worlds in a special vehicle that Kardama brought forth with his powers. As the Lord had promised, Devahuti bore them nine daughters. But the promised divine avatara was not yet born. Sage Kardama then decided it was best for him to continue tapas on the Lord. As he walked towards the forest, he heard weeping behind him. As he turned around, Devahuti was at his feet, “O great Rishi! The Lord has not yet come down as our child. How can He be without a father? Please stay for your son.” Kardama agreed. Finally, Kapila was born. He gleamed with bright skin and dark locks. Kardama bowed to the divine boy and left to meditate upon the Lord. Devahuti chanted a resplendent stuti to the Lord, capturing all in attendance. Kapila later bestowed upadesa to his mother and showed her the beautiful path of devotion to attain the Lord. 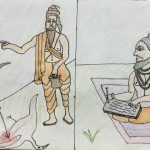 One Response to "Kardama and Devahuti"
Purush! you have narrated it so wonderfully. Very precise. Thank you.